This article is about the suburb of Brisbane. For the suburb of Townsville, see West End, Queensland (Townsville). 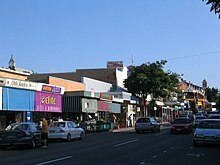 West End is an inner-city suburb of southern Brisbane. At the 2016 Australian Census the suburb recorded a population of 9,474. West End was named by early English settlers who found the area reminiscent of the West End of London. Before the arrival of Europeans in West End, there was an aboriginal camp in the area around upper part of Musgrave Park where Brisbane State High School now stands. Boundary Streets in both West End and Spring Hill were named due to the racist policy of separating European arrivals from the Jagera and Turrbal peoples. The entire riverbank in the West End area was covered with impenetrable rain forest. This was described as a “tangled mass of trees, vines, flowering creepers, staghorns, elkhorns, towering scrub palms, giant ferns, and hundreds of other varieties of the fern family, beautiful and rare orchids, and the wild passion flower”. Along the river bank itself were sandy beaches, water lilies in thousands and dangling convolvulus. Bush rats or fawn-footed melomys existed in large numbers in the rain forest and were hunted by driving them into nets. They were roasted and eaten by women only. They featured in various dreaming tales and tribal lore. The local place name of Kurilpa derives from the name Kureel-pa or ‘place of mice’. The name is still used for various local buildings and institutions in West End and South Brisbane. West End was located in the former Electoral District of Kurilpa. European settlers took advantage of the fertile soil to establish farms and orchards. There were strawberry farms where for an entry fee, visitors could eat all they wanted. 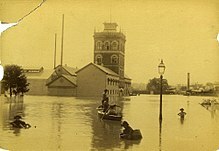 A creek ran down from the Dornoch Terrace area into a reservoir at the corner of Melbourne and Manning streets from where water was sold. After heavy rain, this creek caused local flooding in West End. There was a spring near the site of the Boundary Hotel which was used by residents from the south side of Brisbane to collect water with long queues forming in dry periods. There was industrial development along Montague Road, including the South Brisbane Gas Works, sawmills and a steam joinery. The farms and orchards were steadily subdivided into suburban allotments which were popular due to the proximity of West End to the city, the river breezes and improving public transport. 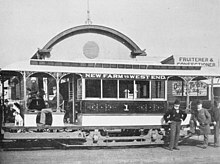 West End was one of the first suburbs of Brisbane to be serviced by a tram line, being opened in 1885. Initially the tram was horse-drawn and terminated in Boundary Street, but in 1897 the line was electrified and extended to the corner of Hardgrave Road and Hoogley Street, via Vulture Street. It was subsequently extended down Hoogley Street to the ferry terminus at the end of Hoogley Street in 1925. The tram line closed on 13 April 1969. The West End Library opened in 1925. The Dornoch Terrace Bridge was completed in 1941, replacing an older bridge across Boundary Street built in 1888. The 1941 bridge was a precursor to a new bridge across the Brisbane River to the University of Queensland, which was never built. A recent University of Queensland Master Plan calls for a new bridge at West End. The former Tristram's Drink Factory, 79 Boundary St, West End, built in 1928 and one of Australia's best examples of the Mission Revival Style architecture was converted into a market in the 1990s and remains a heritage landmark of West End. Scenes for the feature film Jucy (2010) were shot at the now-defunct video store Trash Video in the suburb. The suburb was affected by the 2010–2011 Queensland floods as the Brisbane River broke its banks. From 11 January low-lying areas of the suburb and other places in Brisbane were evacuated. Geographically, West End is bounded by the Brisbane River to the west and the south. The south-western part of West End, along the Brisbane River, is also referred to as Hill End. 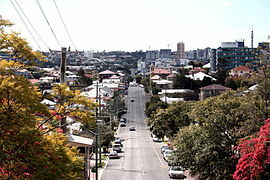 West End is adjacent to the suburbs of South Brisbane and Highgate Hill. These three suburbs make up a peninsula of the Brisbane River. The Aboriginal name for the area is Kurilpa, which means place of the water rat. In the 2011 census, West End had a population of 8,061 people; 50% male (4,029 males) and 50% female (4,032 females). Just over half (52.4%) of households were family households, 34.6% were single person households and 13.1% were group households. The median age of the West End population was 35 years, 2 years below the Australian median. Children aged under 15 years made up 11.5% of the population and people aged 65 years and over made up 8.8% of the population. The suburb has traditionally been home to Brisbane's largest Greek community, with an estimated 75% of Brisbane's Greek population living in West End by 1980. The most common ancestries in West End are English 20.6%, Australian 16.8%, Irish 10.1%, Scottish 8.0% and Greek 5.2%. Indigenous Australians make up 1.5% of the population of West End. For this reason, West End has often been cited as one of Brisbane's most successful multicultural areas. 56.6% of people living in West End were born in Australia, compared to the national average of 69.8%. The other top responses for country of birth were England 4.5%, New Zealand 3.4%, Vietnam 2.7%, Greece 2.7% and India 1.4%. 66.4% of people spoke only English at home; the next most popular languages were Greek 5.9%, Vietnamese 3.3%, Mandarin 2.0%, Cantonese 1.4% and Spanish 1.1%. The most common religious affiliation was "No Religion" (35.3%); the next most common responses were Catholic 16.5%, Anglican 8.1%, Eastern Orthodox 7.4% and Buddhism 5.2%. In recent times, students and academics have moved into West End, taking advantage of the area's proximity to the University of Queensland, Griffith University Southbank (including Queensland Conservatorium) and Nathan campuses and the QUT. West End's inner city location has also attracted many young professionals to the area. Along with the influx of students and young professionals, there has been a growing number of cafes, restaurants, and bars - many with an ethnic, vegetarian or organic emphasis. With these changes, West End is widely seen as Brisbane's home for a younger "chic" or "hipster" crowd. Just over 50% of the dwellings are standalone houses and 37% are higher density residential properties, including multi-storey blocks of apartments and units. Some houses are covered by historic preservation laws seeking to preserve the historical character e.g. tin roofing. Contrasting sharply with the historic homes are new buildings of contemporary designs. Prices for all types of properties have been increasing dramatically in recent decades. According to REIQ, the median unit/town-house price in West End for 2005 is $310,000, and the median house price is $490,500. A flood flag map for West End can be found at the Brisbane City Council website. In May 2012, it was announced that the South Brisbane Riverside Neighbourhood Plan would be resubmitted to allow the construction of 12 storey buildings, considerably higher than the previous seven storey limit. According to the Brisbane City Council's Neighbourhood Planning chairwoman, Amanda Cooper, there are six sites located between Montague Road and the Brisbane River, south of Davies Park, which are at least one-hectare in area, a requirement for construction of the increased building heights. The nature of some developments has led to community disquiet. The redevelopment of the Absoe site is a high-profile example. The area's major attraction is its café and restaurant scene, as well as its shopping, which is centred along Boundary Street. It is also known for its high concentration of ethnic and organic grocery stores. Davies Park on the riverside hosts one of the largest farmer's markets in Greater Brisbane every Saturday called the Green Flea Markets. West End has an industrial backbone, in particular, along Montague Road down to Riverside Drive. Given the value of riverside property now that flooding is better managed, factories are now being sold to make way for upscale waterfront apartments. This is part of a plan to increase population densities in near-city suburbs. It will significantly affect the ability of working-class people to remain in the area and change the economic make-up of the area. As such, West End is currently undergoing urban renewal, with a large change in real estate prices, and new development changing the area demographic. West End Primary School is located on the corner of Vulture Street and Hardgrave Road. The school teaches grades preparatory to six. The school was established on 16 August 1875 with 236 pupils and the student roll has grown to the present total of nearly 800. A second site for the school was announced in 2017 as the current site is too small to cater for expected growth. The same announcement included a new high school for the district as Brisbane State High School in the adjacent suburb of South Brisbane is also unable to cater for expected student numbers. The suburb is well serviced by buses and ferries. Bus services include Route 199 BUZ to New Farm-City-West End Ferry, leaving every five minutes during peak times, Route 192 University of Queensland to City, Route 198 Highgate Hill Hail & Ride (Coles West End-PA Hospital-Woolloongabba-Vulture St-Coles West End) and a City Glider service along Montague Road. CityCat services leave from the West End ferry wharf in Orleigh Street. The ferry terminal was destroyed in the 2011 floods. It was replaced and operating on 24 July 2011. Electronically secured BCC bicycle sheds exist near the West End Ferry Terminal and on Montague Road. Since 1976, West End has hosted the annual Paniyiri Festival at Musgrave Park. 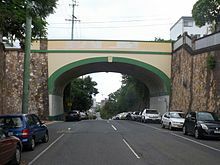 Musgrave Park is located on the eastern boundary in the suburb of South Brisbane. The festival provides an opportunity for the Greek community to share its culture with the rest of Australia. It is Queensland's longest running cultural festival and the longest running Greek festival in Australia. Also held in Musgrave Park is the annual fair day of the Brisbane Pride Festival. West End has a number of galleries and Artist-run initiative which showcase the works of local artists. The neighbouring suburb of South Brisbane, the designated cultural precinct of Brisbane, is home to some of Queensland's most well-regarded cultural education institutions, such as the Queensland College of Art, the Queensland Conservatorium Griffith University, Queensland Performing Arts Centre. However, as Southbank is primarily commercial, many Artists and Students live in the much larger and residential West End. 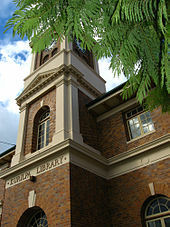 The Brisbane City Council operates a public library at 178-180 Boundary Street (currently known as West End Library but previously known as Kurilpa Library). Queensland Cup rugby league team, the Souths Logan Magpies, play their home games at Davies Park, West End (Bill Tyquin Oval). Prior to 2003, it was the famous Souths Magpies who graced the hallowed Davies Park field and legendary players such as Mal Meninga, Gary Belcher, Peter Jackson, Mick Veivers, Greg Veivers, Harold 'Mick' Crocker, Frank Drake, Mitch Brennan, Bob Linder, Ash Lumby, Norm Carr, Richo Hill and Chris Phelan wore the black and white of the club. Current ARLC Chief John Grant was another ex-Souths player, representing Australia from the club, while legendary rugby league coach Wayne Bennett was a premiership-winning mentor with the Magpies in the mid-1980s. During the 1970s and 1980s, the Magpies were an institution in West End and their 1981 and 1985 Brisbane Rugby League grand final victories transformed the suburb into a party town. Along the river bank of Milton Reach can be found the rowing sheds of a number of Brisbane secondary schools and rowing clubs. Amongst these is the Commercial Rowing club. It was established in 1877 and is Queensland’s oldest amateur sporting club. The South Brisbane Sailing Club has its club house near Orleigh Park. The club was established in 1903 and has been located in West End since 1956. ^ Australian Bureau of Statistics (27 June 2017). "West End (Brisbane - Qld)". 2016 Census QuickStats. Retrieved 28 June 2017. ^ "The Gabba Ward". Brisbane City Council. Brisbane City Council. Retrieved 19 March 2017. ^ Australian Bureau of Statistics (27 June 2017). "West End (Brisbane, State Suburb)". 2016 Census QuickStats. Retrieved 24 March 2013. ^ Cameron Atfield (1 February 2017). "Brisbane could rename historically racist Boundary streets". The Brisbane Times. Fairfax Media. Retrieved 30 August 2017. ^ "THE BRISBANE RIVER". The Brisbane Courier (22, 511). Queensland, Australia. 22 March 1930. p. 10. Retrieved 10 August 2017 – via National Library of Australia. ^ "First Australians and Indigenous sites". Mapping Brisbane History. 11 August 2017. Retrieved 11 August 2017. ^ a b "Growth of a Garden Suburb". The Brisbane Courier (22, 708). Queensland, Australia. 8 November 1930. p. 19. Retrieved 11 August 2017 – via National Library of Australia. ^ "West End (Brisbane)". Queensland Places. 2015. Retrieved 12 August 2017. ^ "THE ELECTRIC TRAM SYSTEM". The Brisbane Courier. LIII, (12, 304). Queensland, Australia. 19 June 1897. p. 4. Retrieved 11 August 2017 – via National Library of Australia. ^ "WEST END TRAMWAY". The Brisbane Courier (20, 959). Queensland, Australia. 27 March 1925. p. 6. Retrieved 11 August 2017 – via National Library of Australia. ^ "Public Libraries Statistical Bulletin 2016-17" (PDF). Public Libraries Connect. State Library of Queensland. November 2017. p. 12. Archived (PDF) from the original on 30 January 2018. Retrieved 30 January 2018. ^ "The Dornoch Terrace Bridge". Highgate Hill and Its History. 21 May 2017. Retrieved 11 August 2017. ^ "A bridge to West End" (PDF). St. Lucia campus master plan. March 2017. Retrieved 11 August 2017. ^ Brisbane Between the Wars. A History by Design. ^ Marissa Calligeros (14 January 2011). "Determination rises above mud and stench". Brisbane Times. Fairfax Media. Retrieved 8 October 2011. ^ "Astrea (entry 600341)". Queensland Heritage Register. Queensland Heritage Council. Retrieved 19 June 2013. ^ "Kurilpa Library (entry 602461)". Queensland Heritage Register. Queensland Heritage Council. Retrieved 19 June 2013. ^ "Dornoch Terrace Bridge (entry 602460)". Queensland Heritage Register. Queensland Heritage Council. Retrieved 19 June 2013. ^ "Wanda Walha (entry 600228)". Queensland Heritage Register. Queensland Heritage Council. Retrieved 19 June 2013. ^ "Brighton Terrace (entry 600343)". Queensland Heritage Register. Queensland Heritage Council. Retrieved 19 June 2013. ^ "Nassagaweya (entry 600227)". Queensland Heritage Register. Queensland Heritage Council. Retrieved 19 June 2013. ^ "Gas Stripping Tower (entry 600342)". Queensland Heritage Register. Queensland Heritage Council. Retrieved 19 June 2013. ^ "West End Gasworks Distribution Centre (entry 601595)". Queensland Heritage Register. Queensland Heritage Council. Retrieved 19 June 2013. ^ "Thomas Dixon Centre (entry 601024)". Queensland Heritage Register. Queensland Heritage Council. Retrieved 19 June 2013. ^ a b c d Australian Bureau of Statistics (31 October 2012). "West End (Brisbane, State Suburb)". 2011 Census QuickStats. Retrieved 24 March 2013. ^ a b "Local History - West End". www.abc.net.au. 2 June 2006. Retrieved 25 January 2017. ^ "2011 Census QuickStats: West End (Brisbane - Qld)". www.censusdata.abs.gov.au. Retrieved 24 January 2017. ^ "2011 Census QuickStats: West End (Brisbane - Qld)". www.censusdata.abs.gov.au. Retrieved 25 January 2017. ^ Moore, Tony (30 July 2014). "Greater Brisbane's multicultural hubs". Brisbane Times. Retrieved 25 January 2017. ^ "Subscribe to The Courier-Mail". www.couriermail.com.au. Retrieved 25 January 2017. ^ "West End and South Brisbane - Insider Guides | Study in Australia". Insider Guides | Study in Australia. 23 December 2016. Retrieved 25 January 2017. ^ "Moving to Sydney Melbourne Brisbane Adelaide Perth? 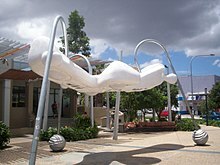 Find where to live cityhobo.com - West End, Brisbane (0-5km)". www.cityhobo.com. Retrieved 25 January 2017. ^ Tony Moore (5 May 2012). "West End objections 'not a NIMBY issue'". Brisbane Times. Fairfax Media. Retrieved 5 May 2012. ^ "West End residents protest 'overdevelopment' of suburb". brisbanetimes. 2 August 2015. Retrieved 11 August 2017. ^ "The Early Days" (PDF). West End State School. Retrieved 12 March 2014. ^ "Two new high schools planned for inner-city Brisbane". brisbanetimes. 8 June 2017. Retrieved 11 August 2017. ^ Calligeros, Marissa (25 July 2011). "West End CityCat Terminal Re-Opens After Brisbane Flood". Brisbane Times. Retrieved 8 October 2011. ^ Amy Remeikis (15 May 2012). "Newman urges tent embassy 'squatters' to move on". Brisbane Times. Fairfax Media. Retrieved 15 May 2012. ^ "Paniyiri Greek Festival, Australia's largest cultural Festival!". Retrieved 15 May 2012. ^ "Commercial Rowing Club". revolutionise.com.au. 11 August 2017. Retrieved 11 August 2017. ^ "South Brisbane Sailing Club". South Brisbane Sailing Club. 11 August 2017. Retrieved 11 August 2017. Wikimedia Commons has media related to West End, Queensland.